SEOUL (Reuters): South Korea’s economy expanded at the fastest pace in three quarters in the last three months of 2018 as a jump in government spending juiced up construction and investment, though weak exports cast a cloud over the outlook for growth. Gross domestic product increased by a seasonally adjusted 1% in the fourth quarter from three months earlier, the Bank of Korea’s advance estimates showed on Tuesday, beating the median forecast of 0.6% in a Reuters survey. The annual pace accelerated to 3.1%, handily outpacing 2.0% in the third quarter and marking the fastest expansion in five quarters. The economy rode a surge in government spending, which increased by 3.1% on-quarter for its biggest rise in almost nine years and helped boost construction and capital investment. “Increased fiscal spending towards the year end has cushioned the blow to exports, as shipments of chips and electronic products are falling,” a central bank official said. Construction investment climbed 1.2% in the fourth quarter while capital investment jumped 3.8%, the sharpest increase in six quarters. Private consumption expanded at double the pace seen in the third quarter with a 1% growth rate. Exports, however, declined 2.2% on-quarter and remained the biggest risk for South Korea’s trade-reliant economy this year. Indeed, the full year told a story of increasing strain across the economy. Growth was 2.7% for the whole of 2018, the slowest expansion in six years but matching the 2.7% growth projected by the central bank. 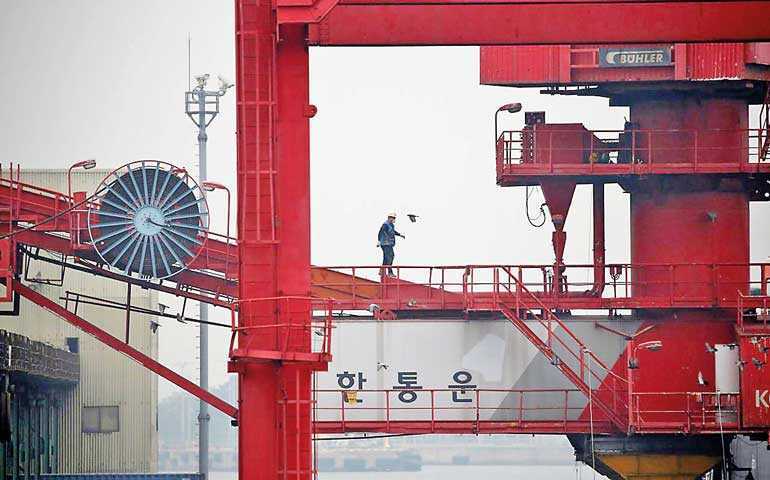 Investor worry a slowdown in the Chinese economy and the Sino-US trade war could severely dent global growth and demand for key South Korean exports items including memory chips and petrochemical products. Growing signs of weakness in China — which has generated nearly a third of global growth in recent years — are fueling anxiety about risks to the world economy and are weighing on profits for firms ranging from Apple to big carmakers. Last year, China’s economy grew an annual 6.6%, the slowest pace in almost three decades, hurt by the trade war and slackening domestic demand.